Castlemaine Brewery Southbank – add your voice ! A proposed development in Southbank adjacent to the old Brewery tower in Queensbridge Street will have the most unfortunate effect on views towards the landmark tower, as well as lop two floors off the c1900 Tea Warehouse, and leaving only the facade and a side wall. It was unfortunately approved by the majority of Councillors of City of Melbourne, who clearly didnt understand its impact or didnt care. Its now up to the Minister to approve it, or not, so now is your opportunity to tell the powers that be what you think. 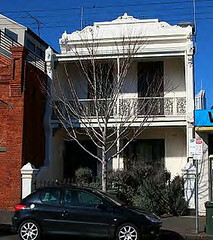 This development should be far more sympathetic to the heritage buildings. 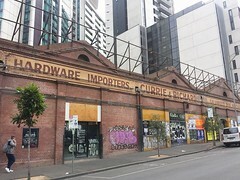 The two upper floors of the c1900 Tea Warehouse should not be removed, and preferably the warehouse should be retained in its entirety, so the tall red brick warehouse section visible from ‘behind’ in City Road remains intact. Any ‘podium’ levels should be setback at least 6m from the Queensbridge Street facades, allowing the warehouse to remain dominant. The podium should also not be built right up next to the 1888 brewery tower next door, dominating it and interrupting views of it from both streets. Any development above the lower heritage building should should be set well back from the side boundary rather than have a tall blank wall, allowing the brewery tower to remain a historic landmark, visible from both streets. This modification would only affect the hotel podium levels of what is a very large development, and so should not be considered unreasonable. ← Southbank Heritage – Have Your Say !